WIPL-D Software suite offers a remarkable variety of tools and features for efficient simulation of EMC. They are rigorously demonstrated by using an EM simulation of metallic PC case tower. The realistic model is easily built in WIPL-D Pro CAD (the tool offers solid modeling capabilities and built in quadrilateral mesher). The PC case dimensions are 45 x 40 x 18 cm. The meshed model has large regular quads on flat surfaces without details and small quads around numerous details. This shows precisely captured geometry and challenging large-to-small scale details included. The first scenario is meant to illustrate the complexity of EM simulation in the cavity. Wire dipole is inside of the case and the result of interest is input impedance. Such result reveals resonance for each of the mode of the cavity. A more complex compatibility scenario involves placing two microstrip filters into PC case and observing the S-parameters. All simulations are run on standard desktop, lasting under a minute for frequency, even for the most complex scenario. The simulation can be partially speeded up by using inexpensive GPU card. 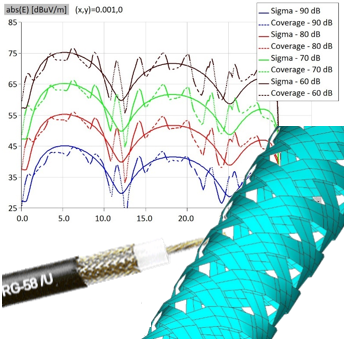 This application note demonstrates that WIPL-D can be efficiently used for simulating EMI propagation of field inside the cables and lines. The focus is on the advanced model of RG-58 coax cable with imperfection braid shield, which can be easily replaced with a very simple equivalent model. After such a transformation, run times are measured in seconds and even the most complicated simulations are analyzed easily and, most important, accurately. We have used such an equivalent model to run a demanding scenario with the total of 2 m coax length. We have demonstrated that with even the smallest suppression of field, the field inside is two orders of magnitude smaller than the field when we leave a coax end open. Next, we show that the field induced in microstrip line is additional order of magnitude larger. All runs can be carried out at standard desktop PC. Significant speed up is achieved if multicore CPU workstations are used. As an additional befit, run times can be shortened by using single inexpensive GPU card. Electromagnetic shielding represents the process of reducing the electromagnetic (EM) field by blocking the field using barriers made of conductive and/or magnetic materials. The exact purpose of EM shielding is to protect devices from the undesirable coupling between interior and exterior space of the device. In this application note we are focused on shielding which is performed by enclosing the area under protection by a conducting shell. As analytical solution for spherical shell is well known as MIE series result. 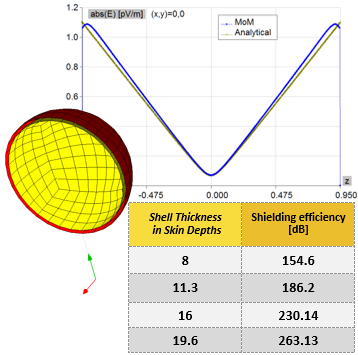 In order to achieve significant reduction of interference field inside the shell, thickness of its walls would be few times larger than skin depth. The field on outer surface of the shell is much larger than field on inner surface, so EM simulation must be carried out rigorously. 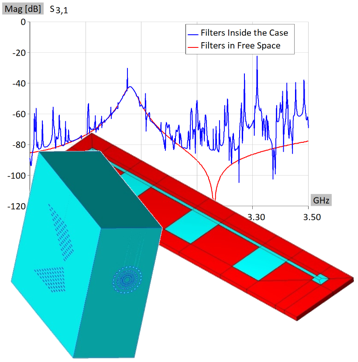 Results presented in the application note show that WIPL-D software package can be used for very accurate analysis of electromagnetic shielding problems. 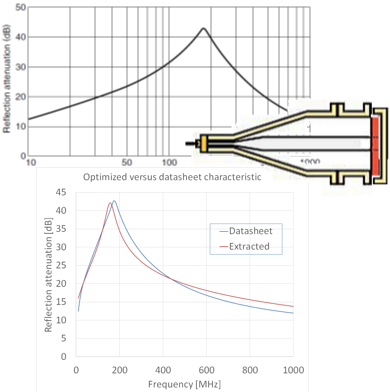 Almost perfect agreement between simulated and analytical results is obtained for problems with shielding efficiency of more than 260 dB. All the models described here are simulated at standard desktop PC with low number of unknowns, in just a few seconds. 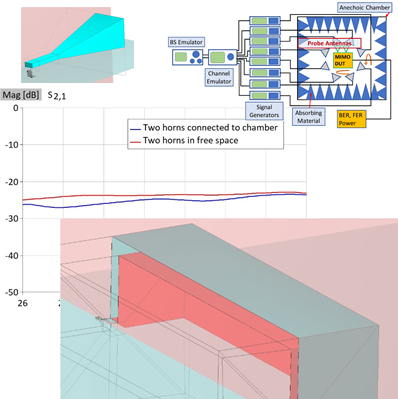 This application notes describes a simplified MIMO scenario showing how multiple horn antennas can be placed inside a large material coated anechoic chamber to test their OTA compatibility. The material characteristic is often unknown, but we show a simple procedure to emulate the characteristic satisfying the simulation demands. The simulations are carried out on multicore CPU and multi-GPU workstation so that simulation times are very short for a very wide frequency band. Built-in interpolation allows quite smooth results, even with 15 points in a very wide band. If a single point is needed, the simulation can be carried out on a regular desktop PC equipped with a single GPU card, wing to GPU solver. The simulation time dramatically depends whether the frequency point is closer to start or end of the band. WIPL-D Pro CAD can be used as an accurate and easy to use software tool. Resonant frequencies are calculated with very high precision. This is verified by comparing WIPL-D results with EM theory. The simulations are carried out at regular desktop PC in negligible time. The powerful built-in interpolation algorithm allows obtaining high precision frequency domain results with very low number of frequency points. The comparison of the results suggests that exciting the cavity with a dipole and a generator is highly effective. All resonant frequencies can be identified and coincide with the values obtained using analytical formulas. 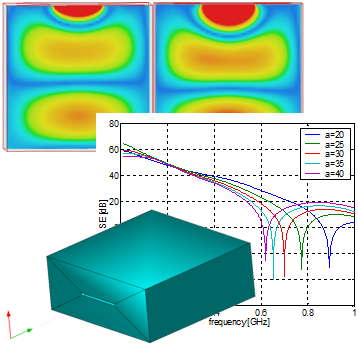 This application note demonstrates emulation of magnetic ferrite tile electrical properties in WIPL-D Pro, a full 3D EM method of moments based solver (with usage of the WIPL-D Optimizer). Usually, the electrical properties themselves are unknown, while the performance of magnetic materials is provided in standard datasheets. Such magnetic materials can be used as absorbers in electromagnetic compatibility (EMC) problems and thus, the problem is of significant importance to electrical engineers. In measurements, the electrical properties of materials are usually determined via the coaxial tube method. A hollow tube is made of the material with the unknown properties (e.g. magnetic ferrite tiles) and then inserted into a coaxial line. By using a relatively simple expressions for electromagnetic (EM) properties of material, we can optimize their performance until they reach the specification given in datasheets. A coaxial tube method (employed in EM solver) is used as emulation tool, with simulation and optimization performed in WIPL-D software suite. The magnetic material in question was selected as TDK IB-017. We demonstrate that efficient use of the EM software allows simulation of magnetic ferrite tile materials. Although the electrical properties are given as performance characteristic (from the datasheet), the EM properties of the material are obtained by the optimization. The simple linear characteristic model yields excellent results, while improved parabolic model yields almost the perfect agreement with the datasheet data. All simulations are extremely short and do not require any particular hardware. 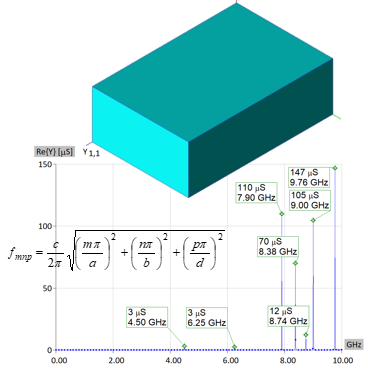 The aim of this application note is to calculate the shielding effectiveness of a PEC box with a slot, excited with a plane wave incident in the direction perpendicular to the slot. The electric field shielding effectiveness is calculated as the ratio of the impinging field to the field measured at certain point within the waveguide, distant from the slot. The theory assumes that a single TE10 waveguide mode propagates from the aperture and normal to it. Higher order modes, and modes propagating in other directions may exist which will complicate the results, and introduce need for EM simulation in order to predict the shielding effectiveness. The results of EM simulation are in excellent agreement with results obtained by using intermediate level simulation tools from University of York, and easily obtainable by using their online calculator. The objective is to investigate the influence of changes in box and slot geometry as well as in position inside the box. in that sense, all parameters are fixed and single geometry variable or field position is then varied as a series of tests. With common use of modern communication devices, it has become an imperative to calculate the impact of EM fields to human body. 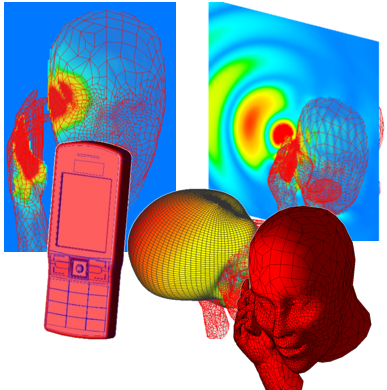 This application focuses to the effects of a mobile phone to human head at 1.8 GHz. By using the WIPL-D MoM efficiency, it is possible to simulate realistic model of the cell phone and the human head. The geometries were provided as CAD files, imported, repaired and meshed in WIPL-D Pro CAD with all the details originating in the mechanical CAD model. The cell radiates via PIFA and exposes the human phantom to EM radiation, which is demonstrated via both near field and SAR. Results also include radiation pattern for 3 scenarios (PIFE in free space, mounted to cell and in vicinity of head). All simulations are carried out at regular desktop quad core PC. For electrically more complicated models, the simulation time has been decreased by using WIPL-D GPU solver and widely available inexpensive Nvidia CPU cards. The GTX series offers large computing power for rather small investment. The end result is that simulation time are measured in seconds or minutes at most. Electromagnetic (EM) environment is an integral part of the modern world. The EM environment created intentionally and unintentionally by various sources. If the EM filed becomes strong enough, it can influence the operation of many electrical and electronics devices. The EM environment usually encompasses a receptor (a receiver of EM interference). The ability of a receptor (device/equipment/system) to operate satisfactory in EM environment without introducing intolerable EM disturbances to other devices/equipment/systems in the same environment is called electromagnetic compatibility (EMC). WIPL-D Software suite can emulate numerous EM experiments. With remarkable variety of tools and features such as extremely efficient Method-of-Moments (MoM) based simulation kernel, GPU and CPU simulation on inexpensive computer platforms, ability to handle large-to-small details within one model, dedicated technical support team, WIPL-D is indispensable EM simulator for EMC. 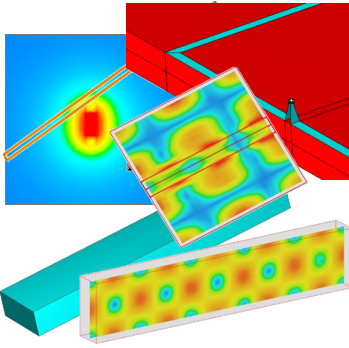 EMC simulation capabilities are demonstrated with several basic examples: EM field in the vicinity of transmission line, waveguide resonator, wire in cavity, microstrip line with slot and printed circuit.